Duncan Fraser, former vice chairman of the Inverness Taxi Alliance who are proposing joining the GMB union photographed in the Castle Wynd taxi rank in the centre of Inverness which is under threat. Picture by Sandy McCook. 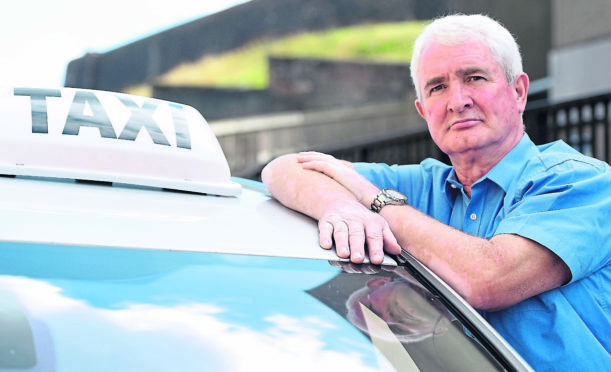 Inverness taxi drivers have threatened strike action after joining ranks with a national trade union – claiming it aims to use its “clout” to take on the “arrogance and contempt” of Highland Council. The GMB Union has pledged to take the local authority to task after the Inverness Taxi Alliance (ITA), which has around 100 members, was announced as an affiliate member yesterday. Duncan Fraser, the proposed ITA representative to the union, said the move strengthened their cause after tensions rose amid alleged over-provision of licenses coupled with insufficient rank spaces and the imminent closure of the city’s Castle Wynd rank. The pact with the union was confirmed yesterday after ITA’s Annual General Meeting where the majority of members voted in favour of joining. Liz Gordon, of the GMB, has welcomed the taxi drivers on board, saying: “There are many challenges within this sector such as licensing, boundaries and health and safety. Mr Fraser, formerly ITA vice-chairman, did not stand for re-election in order to put his name forward to become the ITA representative to the GMB. ITA Chairman Andrew MacDonald was delighted by the move after long complaining about what he sees as “shabby treatment” from the local authority. ITA had gathered signatures for a petition against the closure of the rank as well as a potential strike. A council spokesman denied any allegations of legal wrong-doing, adding: “The council adheres to its duties under law to act following procedure and in recognition of the roles that Taxis and Private Hire operators have. Councillor Ian Brown, the former chairman of Inverness City Committee, said: “It would be very disappointing if it went as far as strike action. That is no help to the drivers and it is not help for the customers. The Inverness Taxi Alliance has long campaigned for better conditions for drivers in the Highland capital. Central to their concerns is the cost of taxi licenses which they say is endangering their livelihoods. Official figures show fees for taxi licences in the Highlands can reach around double the equivalent charges in neighbouring areas. In Aberdeen, the driver licence costs £105, in Aberdeenshire it is £88, and £98 in Argyll & Bute but in Inverness a driver can expect to pay £272 – the highest of all the surrounding regions. The Alliance has also been infuriated by what they say is the over provision of licenses which is not capped, while at the same time reducing rank spaces. The chairman of the Alliance, Andrew MacDonald, noted the number of taxis rose from about “300 in 2010 to 450 in 2018”. Perhaps the biggest issue faced by drivers in the city is the closure of the Castle Wynd rank to make way for the redevelopment at the castle. Inverness city manager David Haas earlier defended the council saying: “We recognise their position and the fact that livelihoods depend on a good rank and that is why we have taken the steps we have to offer alternatives.